← A question for my Blog readers! “The effect of initial resource assignment on calculation of Individual resource’s work. Suppose we want have two resources R1 (100%) and R2(50%) to work on a 20h fixed unit task. When we enter 40h of Work first, BEFORE simultaneously assigning the resources. After we assign, for example, two resources (one with 100%, an another with 50%), total work for the Task has been changed. Why does Project disregard each resource’s assignment units and assigns total work of 40h to each resource so that the total work increases twofold? OK! I will follow the question step by step! Q: Why does Project disregard each resource’s assignment units and assigns total work of 40h to each resource so that the total work increases twofold? A: Because, in MS PROJECT, if you put Work for Task, for example 40 hours, it means that every Resource should spend 40 hours for completing that Task. That’s how it works! Let’s say that you want for your Task that Each Resource should work 20 hours for that Task. 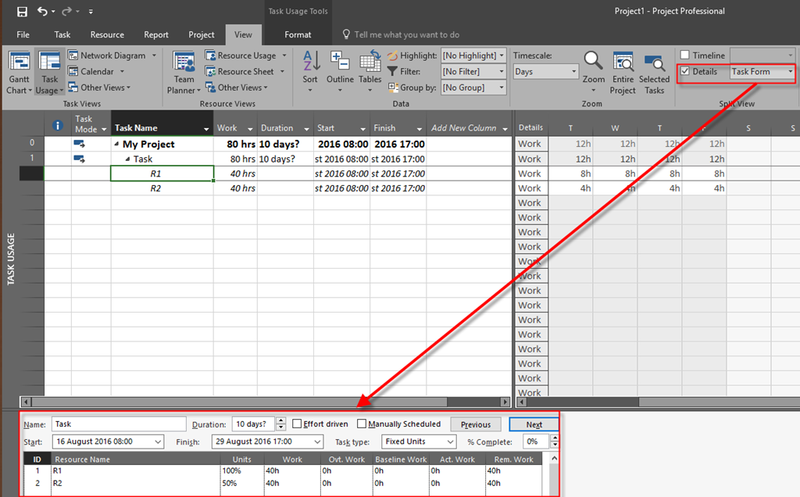 In Fixed Units Task Type, if you want to assign different work for the Task, you must specify exact work for each resource. Otherwise, if you put work amount for the Task, and then assign Resources, each Resource will have same amount of work! This entry was posted in Microsoft Project 2013, MS PROJECT 2010, MS PROJECT 2016, PMI, PRoject Management and tagged Micorosft Project 2016, Micorosft Project 2016 - Schedule, Micorosft Project 2016 - Tasks, microsoft project 2016 - resources. Bookmark the permalink. Sorry to post here but how do I send a question to you? Thank you for an excellent answer. But what should I do if I don’t know or don’t care about the anount of work for each individual resource? What I do care is that a fixed units task with a 40hr of work be performed by two resorces R1 (100%) and R2 (50%). How can I set up such a task? Than you should use Fixed work! Why? Because if you know that you will need 40 hours, and you do not care about who is working 20 or 30 hours, then you rwork is FIXED!